This disc comes without a title. 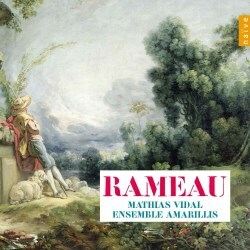 It is clearly inspired by the commemoration of Rameau's death in 2014, the year of its release. It brings together specimens from two different genres. The Pièces de clavecin en concerts rank among Rameau's best-known compositions and are frequently performed and recorded. In comparison his chamber cantatas are far less known, and not that well represented on disc. In its scorings this recording differs from what is otherwise on the market. The five concerts which were published in 1741 under the title of Pièces de clavecin en concerts were written under the influence of the very first sonatas for an obbligato harpsichord and violin published in France: the sonatas op. 3 by Jean-Joseph Cassanéa de Mondonville. Even the title was inspired by that collection: Pièces de clavecin en sonates. Rameau scored his concerts for harpsichord, violin or transverse flute and viola da gamba. The publisher added a second part for a violin which could replace the viola da gamba, probably in order to increase sales. The concerts comprise three movements - except the second, which has four - which mostly refer to a character from Rameau's time, such as Forqueray - probably the famous gambist Antoine or his son Jean-Baptiste, or possibly another member of that family - and (Marin) Marais. In this recording the 5e Concert is performed in the scoring indicated by the composer. The 2e Concert is played here with an oboe which either plays in alternation with the violin or colla parte. It is questionable whether this is in line with Rameau's intentions. Composers usually left much to the interpreters, but the title page doesn't give any indication that other instruments may be used. That in itself is not conclusive, but in this case the participation of an oboe is musically unsatisfying. It is too dominant, not only in relation to the violin but also to the harpsichord. The keyboard is the central element here and has the lead. It should not be overshadowed by one of the other instruments but that is exactly what happens here. However, that is also due to Violaine Cochard's playing which is too restrained and rather bland. The 5e Concert is played in the original scoring and here the result isn't that much better. On the whole I find these performances not very engaging and the dramatic elements which are always present in Rameau's music - a man of the theatre by instinct - are seriously underexposed. Rameau's dramatic talents are also to the fore in his chamber cantatas. The emergence of this genre in France was due to the increasing influence of the Italian style dating from the beginning of the 18th century. French composers started to write such cantatas for performance in the salons of the aristocracy and the upper echelons of the bourgeoisie. The form is modelled after the Italian cantata: a sequence of recitatives and arias. There are also differences. Italian cantatas were almost exclusively scored for high voices - soprano or alto - but French composers also wrote solo parts for a tenor or a baritone. Whereas most Italian cantatas are for voice and basso continuo, French cantatas often include parts for one or two treble instruments, called simphonie. It is mostly left to the interpreters to choose which treble instruments to use. Most common were the violin and the transverse flute. Another option was the oboe, which is played here in both cantatas. In the second aria from Le berger fidèle Héloïse Gaillard plays the recorder. That cannot be excluded, but it also needs to be said that in Rameau's time the recorder was unmistakably in decline. The pastoral nature of the aria could probably be best expressed by using a transverse flute, but apparently Ms Gaillard doesn't play that instrument. More problematic is the performance of these cantatas by a tenor. Both were originally scored for soprano. The choice of a tenor in the cantatas "reflects our wish to restore all their liveliness and their vivacity to these miniature dramas and is logically consistent with the characters they depict, the musician Orpheus and the shepherd Myrtil". I am quite surprised and not convinced by this line of argument. The logic of why a tenor is needed to create "liveliness" and "vivacity" escapes me. Can't a soprano do the same? The second argument is dubious. If the performance by a tenor is "logically consistent" with the respective characters, why didn't Rameau score these cantatas for such a type of voice? It is also questionable whether Orpheus and Myrtil are the protagonists in these cantatas. In both cases the recitatives are sung by a narrator who then announces the feelings of the respective characters in the arias, such as in the opening recitative from Le berger fidèle: "And thus his voice proclaims his grief to the echoes". In Orphée even a large part of the middle aria is given to the narrator, and the closing aria sets out the moral of the story. The characters hardly play a role here; the arias are rather quotations of their feelings. Although I have my doubts about the decisions in regard to the performance with a tenor of these cantatas they are by far the best part of this disc. Whereas the Concerts are largely disappointing, Mathias Vidal delivers theatrical interpretations of the cantatas, showing convincingly how French and Italian elements have been mixed. Now and then he uses a little too much vibrato but on the whole his singing is stylish, although it is regrettable that no historical pronunciation is adopted. As the cantatas constitute a relatively little-known part of Rameau's oeuvre it is these pieces which are the reason to consider this disc.